We developed this high pressure cleaning machine to clean even persistent dirt with high pressure. I a protected area, parts can be cleaned efficiently with high pressure up to 48 bars. The ergonomic design and the door adjustable in height allow a comfortable handling for the worker. 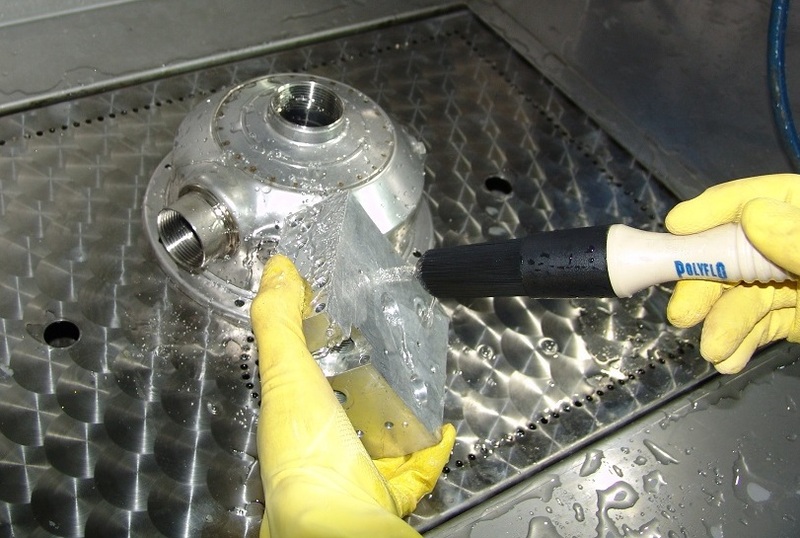 With the high pressure spray gun, parts can be cleaned quickly from persistent dirt. Furthermore, a cleaning brush is integrated in each Power Box. A blow gun can be added optionally. The washing tank of the machine is insulated and the medium is being filtered by the filter with mesh in stainless steel and the fine filter cartridge placed between high pressure pump and the charging pump. A safety pressure switch supervises the pressure before the high pressure pump and advertises when the filter is dirty. The cabinet is equipped with a large panorama window and an interior lightning. The window can be cleaned with a nozzle. The Power Box is highly rugged and qualitative. The construction in stainless steel and the employment of high quality components offer a long product life. 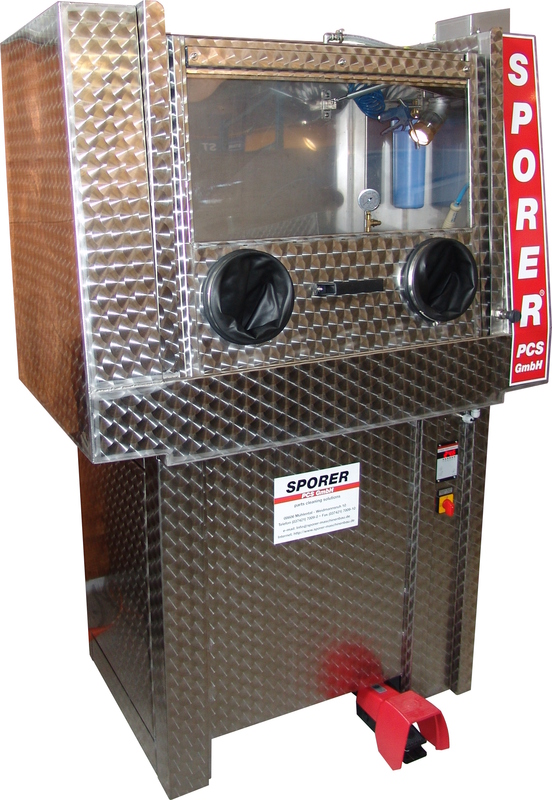 In this machine, parts may be cleaned with a cleaning brush and a high pressure spray gun. A blow gun can be integrated optionally. In that way, the parts can be blowed off directly after cleaning inside the cabin. The medium is filtered with a filter with mesh in stainless steel (filtration 200 μm) and a filter cartridge (filtration 50 μm). This filter cartridge is disposed between the high pressure pump and the loading pump. Both filters can be taken out for cleaning. Firstly, put the parts which have to be cleaned into the machine. After the door has been closed the high pressure pistol can be handled through the two gloves. 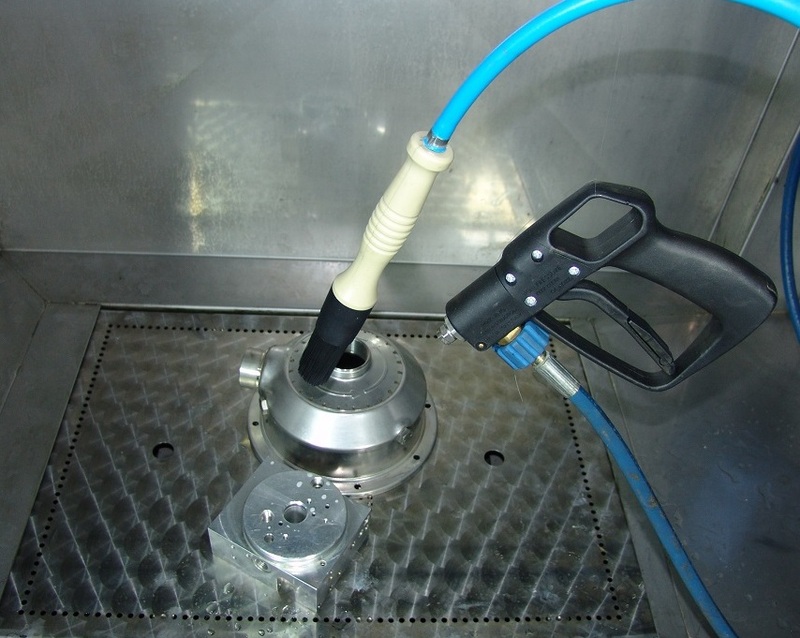 By activating the foot switch and the trigger of the high pressure pistol, the plunger pump brings the cleaning fluid on the parts to be cleaned. The plunger pump is filled by the charging pump. Between the two pumps, a fine filter with filter cartridge is disposed. The interior lightning and the exhaustion fan are also activated with the foot switch. The window rinsing can be used as needed. There is also the possibility to clean the parts manually with the cleaning brush. For this purpose the door has to be open. After activation of the foot switch the pump conveys for nearly 2 minutes the heated cleaning medium from the tank through the supply guiding to the cleaning brush. Now the parts can be cleaned manually. From the cleaned parts the medium flows back into the tank through the filter box. The interior lightning and the exhaustion are active during the manual cleaning with brush. Digital, electronic temperature control "Parts Clean Control"